Oregon not only holds first place in the nation for grass seed production, we are also number one in Christmas tree production. 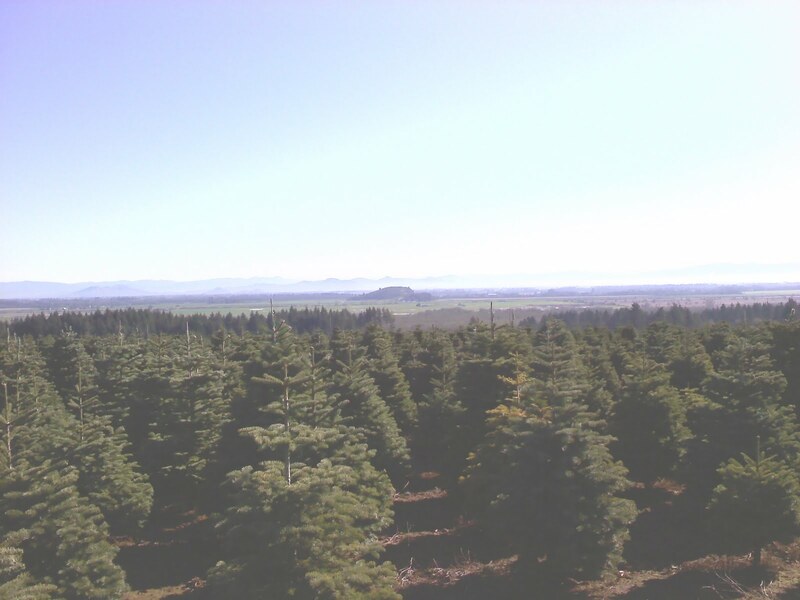 According to the National Christams Tree Association 2007 reports, Oregon growers raise Christmas trees on nearly 67,000 acres and harvested 6.85 million trees for the Christmas season that year. In 2007 Oregon had nearly 40% more Christmas tree acreage than the second place Michigan and harvested nearly double the number of trees than second place North Carolina. We are a big player in Christmas tree market. 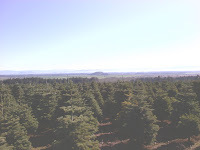 Here is a 2008 report of Christmas tree production in Oregon compiled by USDA. 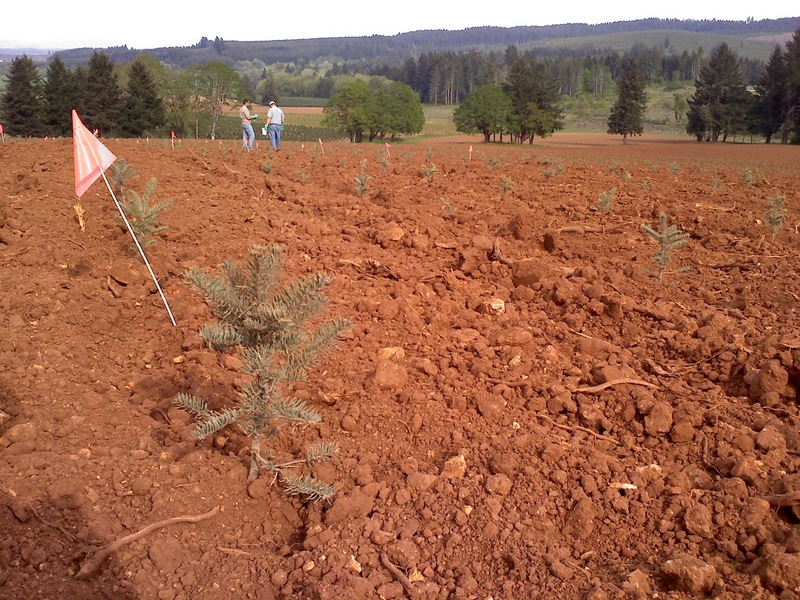 Most Christmas trees in the Willamette Valley are planted without starter fertilizer. The red mountain soils we have around the edges of the Valley are very low in phosphorous. The mycorrhizae that colonize the trees roots and mine the soil for phosphorous and other nutrients is abundant but it takes time for it to become established with a new planted tree. Christmas trees are usually transplanted from the nursery to the field in the spring which can result in a stressful summer if we don't get a few rain showers or we have a dry fall. So, I wanted to see if we could learn anything in a planting fertilizer trial. Joe Cacka, our division agronomist, and Paolo Sanguankeo, Joe's research assistant, are overseeing the trials. I'm just the helper. 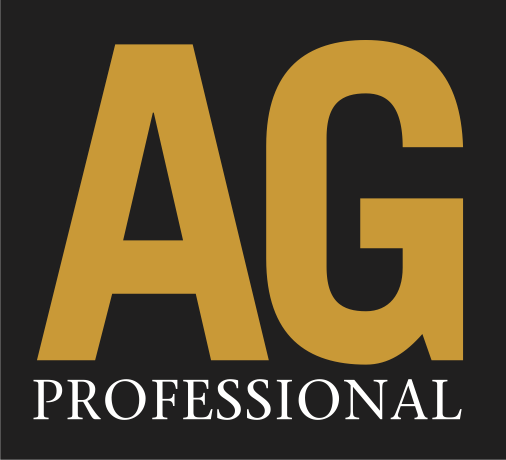 The trial consists of nine treatments replicated four times on a newly planted field. We took diameter measurements of each tree in each replication so we will have a quantitative baseline to observe tree growth. Next spring we will be able to observe how much new foliar growth we get from the trees under different applications in comparison to the untreated check. 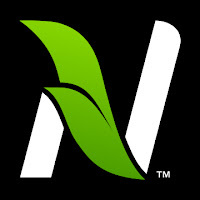 Planting fertilizer is not a new concept but it is something we have not played with much. We use a starter fertilizer in all of our other crops so it makes sense to see a response in the trees. A big thanks to Joe and Paolo for overseeing this trial and ensuring that we get some measurable results. Christmas trees are harvested and sold based purely on how they look; color, shape, fullness, height, etc. This can be fairly subjective and thus difficult to quantify in a trial. The last couple years of a tree's life in the field are very important. The last two to three years of growth are what we as consumers see in the tree lot. Diseases, chemical damage, insect damage, or drought stress are some of factors that can cause a tree to be unfit for market. 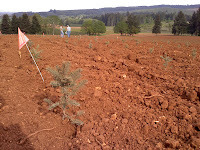 The whole purpose of this trial is to see if we can affect the last couple years of growth by giving the seedling Christmas trees a good head start. We'll be watching these trials for the next couple years so I will write an update once in a while when we start to see something interesting.